These are the 3 nail polishes I finally wore and swatched. 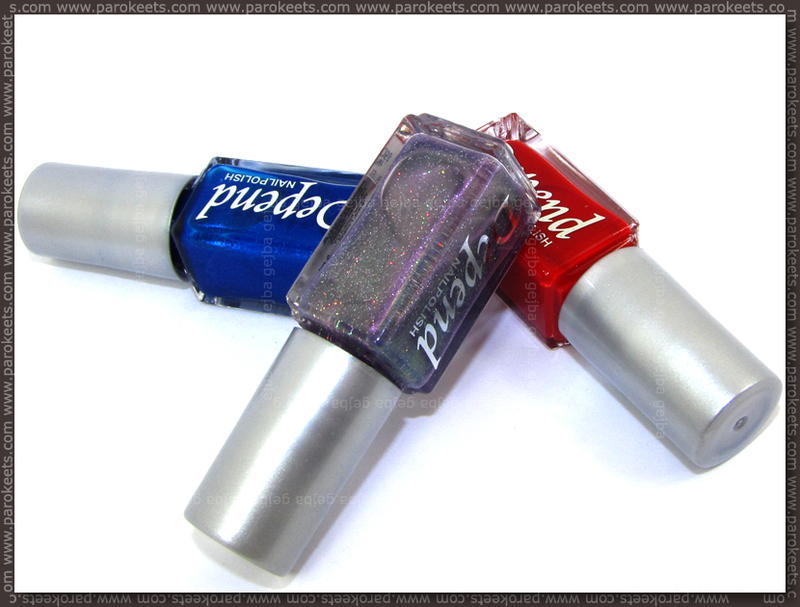 Creme red, shimmery blue and duochrome holo glitter. Depend 040 nail polish is one of those creme red beauties that lean from slightly cool to warm undertone, but could just as easily pass for neutral part of the time. Application was easy, and if you’re not fussy, one layer can give you full coverage. I always like to use 2 coats for perfect look and longer staying power. I added one layer of top coat. For next 2 shades I went for 3 thin layers. These kind of shades just look better to me if I use more of thinner layers, it sort of gives me deeper/richer color without unevenness. Of course you have to be smart about it and wait for the polish to either dry little bit and then use fast drying top coat or skip the “fast” in the top coat. As you can see, I was not smart with Depend 058 polish. But you can still kind of see the duochrome green-purple effect and holographic glitter that binds it together. 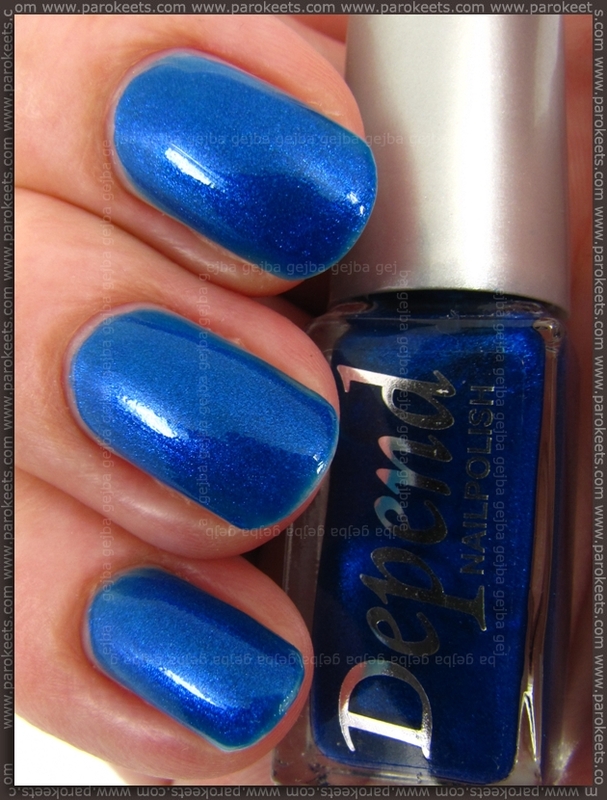 No secret that I love electric blue nail polishes, so no wonder I loved Depend 041 nail polish. I wore this one as 2 and 3 coater. 2 coats result in more greenish-blue shade, while 3 deepen it to almost completely blue color. Pretty blue shimmer is added bonus. 3 coats + top coat. I’m loving Depend 058. Thank you for the giveaway! I really like the 058! So pretty! 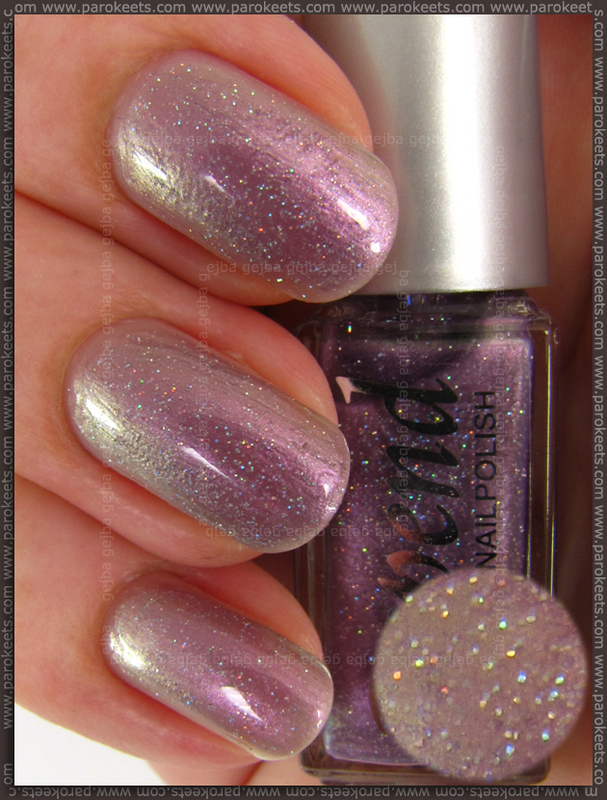 Of those you swatched, Depend 041 is definitely my favourite. I like the Blue 041 best. Thnk you SO much for the Giveaway! I like Depend 040 nail polish. I loved Depend 041 nail polish. They have a great silver glitter nr 047 that I use a lot for gradients. I love the pretty 058!! V moji zbirki so le trije Depend laki, vsi iz Holographic kolekcije. :wub: Zaradi holografskega finiša so mi še posebej pri srcu, čeprav so slabo prekrivni in so bili kar dragi glede na to, da vsebujejo le 5 ml. Thanks for the chance to participate, I don’t own any depend polishesn nr58 looks really nice! Depend 058 is so beautiful! Depend 058 is my favorite! The red one…oh the red one… love at first sight. Waw,res lepi odtenki :) 041 mi je še najlepši!